Hoping to get some insight into why my BB print head keeps blocking half way through big prints. I end up with a baked hard nozzle plugged with black / brown PVA. Really frustrating 10 hours in. If anyone can suggest a solution I would be very grateful. Using UM3 Extended. I love the design of that fence! There's several reasons that PVA can fail, the main reason being humidity. 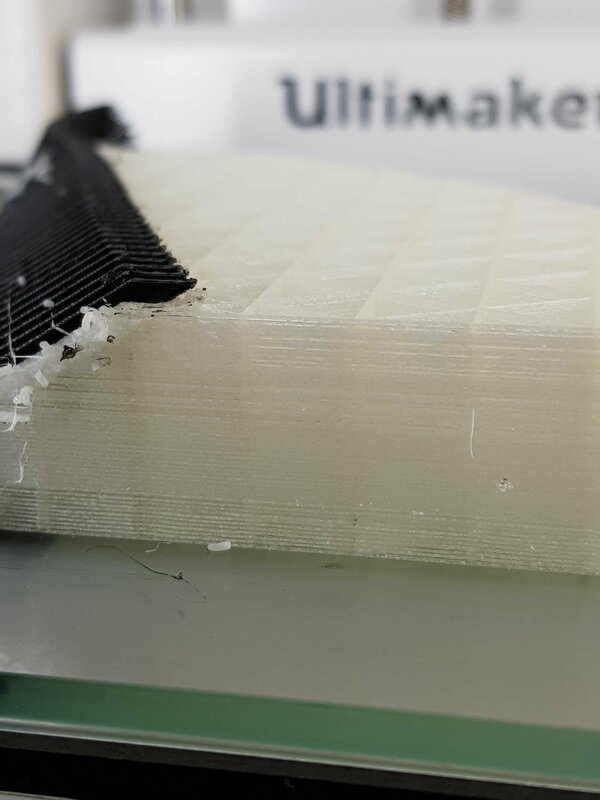 PVA is extremely sensitive to humidity, and it can degrade quickly if left out in the open for hours, like during a 10 hours print. And New Zealand isn't the driest place on Earth. For this roll of PVA, you can save it by putting it on a box with a packet of silica gel to absorb the moisture, or even heat it on the printer itself or on an oven at low temp for a few hours. 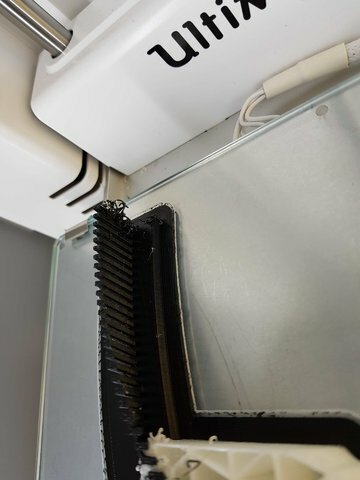 Alternatively, as I see on the second picture that there is a 'max temp error' message on your printer, it might also be a fault within the printcore or the printer. Does that error message shows often? Have you been able to test with another BB core to make sure the problem isn't with the core you're using? I have seen that error before. It can happen when pulling out a core. While I would still follow @Brulti's advice, I would assume you pulled that core out to take the pic. Be careful about that and do not fry a component. That would be my fear. I figure there is a reason that UM put in a specific removal set of steps to follow. And, yes, the PVA can be really hurtful about the PVA. Maybe @Labern could shed light on how that environment would affect things. Also as they said, if your printer is in a high humidity area, a long print print may ruin the spool, then you need a feeder box with desiccant. I also see some bad Brim, you should do a bed calibration. Hi all - thanks so much for all of the feedback and ideas. Have removed the nozzle from the print head and soaked it in ammonia to remove the burnt PVA. As the PVA moves works perfectly for hours before becoming blocked I am wondering if the might be a heating problem with the print head so will order another. I'm based in Queenstown NZ which has vert low humidity generally so not expecting that to be the issue but will order more PVA as well - just wish it wasn't so expensive. The error message on the screen was a result of removing the head from the machine when it was paused. Was hoping to continue the print without the PVA to see if it could finish but no go. This issue - PVA clogging the nozzle has been an issue on almost every print I have done using it so am considering changing to break away or hips but prefer to stick with PVA to improve the finish. Attached is an couple of images of a house model I need to print - design is loosely based on the Riverside Museum in Glasgow. I need the skillion roof to be removable so will use a lot of PVA to form it so need to get it right. If anyone has any ideas on how best to attach it or want the stl files to have a play yourselves let me know. I am currently thickening walls etc to make it printable. If the PVA is too humid then it's obvious because it sizzles and crackles as it prints. Because it's boiling. I'm not sure why your PVA is clogging. Is this recent? I'd consider cleaning it using the cold pull procedure which is in the menu system on the printer. Hot and cold pulled multiple times to no avail. Believe the clog was stopping the PLA getting into the nozzle to be heated. 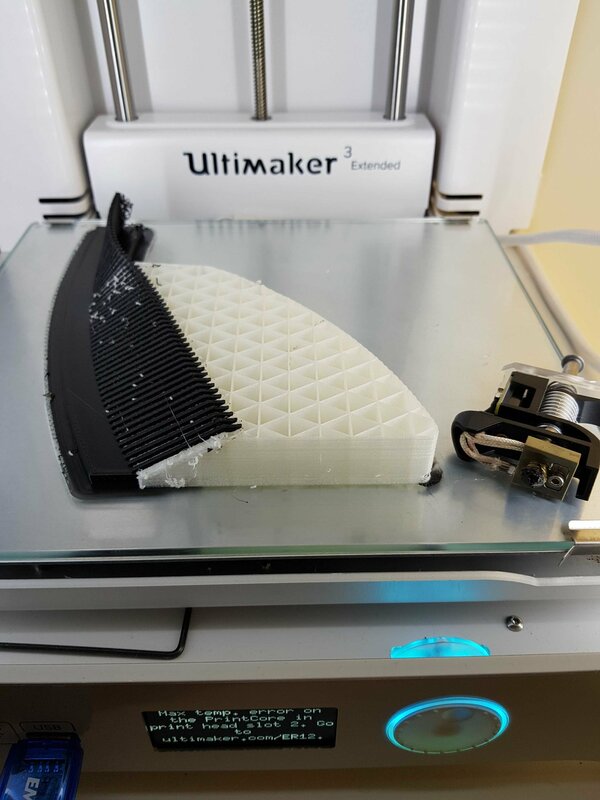 You may be right about the PLA having moisture - will try again with new material - I just cant understand why it takes quite a few hours before it clogs. Did it crackle and pop when printing as @gr5 asked? That is really the ultimate test of whether the PVA has moisture or not. I have noticed some bubbling early when I first started but not recently. Will try new material and see if it sorts the problem. Do you mean PVA? You are confusing me. PLA doesn't absorb moisture. You can probably even store it underwater if you want (don't quote me on that - never tried it). If the PLA nozzle is "clogging" I have completely different advice. If the PVA (=white dissolvable support material) is clogging, and the underside of the roof will be invisible and unimportant, a temporary solution might be to print the roof with only one nozzle, and generate supports in the same material? And then break these supports off, just like we do on a single-nozzle printer. Of course this is not a permanent solution, but it might enable you to get the work done on the deadlines, for now. And in the mean time you can try to find out why the support material clogs, or dry it. PVA was clogging. Was using PLA for hot and cold pulls. Ok...screw the printing issues...I want to see that print. That looks cool! And, I agree that the underside of roofs and other hidden areas are not of worry.